On June 29, 2017 at the Canada Games Sport for Life Centre $19,000 in academic scholarships were presented to fourteen high school students, six university students, and four Manitoba coaches. The presentations included the Manitoba Foundation for Sport Scholarships, Bud Tinsley Sport Leadership Scholarship, Coaching Manitoba Bursaries, and Princess Royal Pan Am Scholarships. Basketball players who were recipients of the awards includes James Wagner, Kerri Kuzbyt, Anoush Sepehri, Jessica Edel, Bailey Paziuk and Dylan Sutherland along with coach Jon-Ross Merasty-Moose. Also presented was the Manitoba Sportswriters and Sportscasters Association (MSSA) Jack Matheson Award which provides $750 to post-secondary students who demonstrate an interest in a career in one or more of the following careers: sports writing, sports broadcasting, sports media production or sports public relations. The Manitoba Foundation for Sports scholarship program administered by Sport Manitoba announced a new scholarship this year. Jennifer Fleming created the Fleming Family Hockey Coach Scholarship, in memory of her father Jake Fleming and her brother Wayne Fleming, to recognize an upcoming Manitoba hockey coach who shows similar coaching and leadership traits that were characteristic of both Jake and Wayne. This year the Manitoba Foundation for Sports scholarships (MFFS) recognized the exceptional achievements of 17 student athletes. These athletes represent 10 towns/cities and 16 different sports. This scholarship was created in 2012 in memory of Robert (Bud) Tinsley, by his family and friends. The $500 scholarship recipient is selected from among the Manitoba Foundation for Sport scholarship recipients, based on the added criteria of leadership. This year’s recipient is Jessica Edel of Morris. Through hard work, dedication, and fortitude, Edel’s grade 12 average was 93%. She is attending CMU to play volleyball with a major in Biology and a minor in Math. Edel also received a $500 MFFS. One male and one female each from Winnipeg and Rural Manitoba received a $500 bursary to be used toward their 2017-2018 tuition. The bursaries have been named after two special coaches in Manitoba: Silvio Sboto and Jeff Collins. 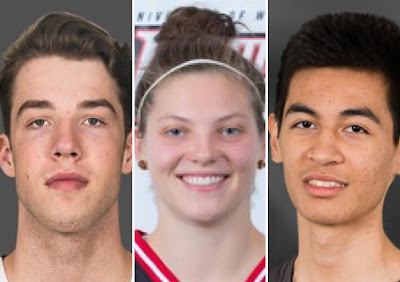 One male and one female high-performance athlete enrolled in a post-secondary institution in Manitoba each received $3,000 today. The Jack Matheson Award provides $750 to post-secondary students who demonstrate an interest in a career in one or more of the following careers: sports writing, sports broadcasting, sports media production or sports public relations. The award is named in honour of the late Jack Matheson, a former Winnipeg Tribune sports editor and CJOB radio broadcaster. He was one of the first in Manitoba to hire graduates of post-secondary education programs for jobs in the sports journalism field. There were two winners of this year’s Jack Matheson award. Stefanie Lasuik is a recent journalism graduate of Red River College and University of Winnipeg. She served as sports editor of the Projector, Red River College’s student newspaper, and spent two summers working for the Stonewall Teulon Tribune and Selkirk Record. She also sold out a book about golf and was a sports anchor on Red River Radio. Stefanie, who also interned for the Winnipeg Jets and Manitoba Moose, is currently working as a news reporter at the Winnipeg Free Press. Nolan Kowal is also a recent journalism graduate after completing the creative communications program at Red River College. He built up a strong sports work portfolio, performing radio and TV play-by-play for University of Manitoba Bisons hockey games, serving as a radio board operator for Winnipeg Blue Bombers and Winnipeg Goldeyes contests, and interning as a game reporter for the Winnipeg Jets and Manitoba Moose.